In fact, it's been just "cool" enough after this hot summer we've had that I have already made three different soups this fall, but I haven't quite let go of my cucumber salads yet either. Although it's nearing the end, some of our local summer produce is still in abundance, so when I asked The Cajun to pick up some more cucumbers on his way home for yet another Creamy Cucumber and Tomato Salad, cucumbers and zucchini were were in huge piles right next to each other. He grabbed a pile of what he thought were cucumbers, not knowing some were zucchini. I've mentioned many times in my blogging that while I'm a big veggie lover, The Cajun is not, though I have to admit, cucumbers and zucchini do look quite alike! I've also mentioned that as a blogger of southern food, well... we tend not to eat as balanced as we should, trying to bring our classic and favorite southern recipes to our blogs, and so, for us, it's often an extra effort to get in the vegetables we should. Oven roasting is an easy way for me to get in my veggies, and the higher heat process really intensifies the flavor and transforms the texture, giving a browned and often crisped exterior to many vegetables, against a creamy, soft feel inside. It's one of my favorite ways to cook vegetables, and they're a perfect side dish addition to your table any time of the year. Many vegetables roast beautifully, including russet, yukon, red and sweet potatoes, carrots, bell peppers, asparagus, broccoli, cauliflower, green beans, cabbage, corn, mushrooms, summer and winter squash, turnips, parsnips, rutabaga, eggplant, and even brussels sprouts, a vegetable I am still trying to learn to love. A temperature of 425 degrees F seems to roast them just right - anything lower is really just baking them - though some vegetables, such as the root veggies, take a little longer than others, and softer veggies much shorter, making it a basic process of learning when to add or remove others. The other rule is to try to be as uniform as possible with the sizes of the cuts you use so that everything is about the same size. 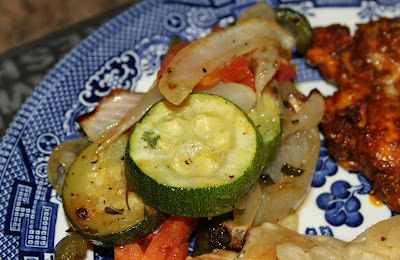 This time I roasted what I had - those zucchini, plus some sweet onion, bell pepper and tomatoes. I threw everything but the tomatoes in all at the same time, though if you want the zucchini to be more firm, wait to add them in the second roast, along with the tomatoes. What a great way to wrap up the best of summer veggies! A great side dish to anything! If there's any leftovers, I love stuffing them in an omelet for breakfast, rolling them up in a tortilla for a veggie wrap or adding them to a quesadilla for lunch the next day. The flavor is so good! Preheat oven to 425 degrees F. Put zucchini, onion and bell pepper in a bowl, drizzle with olive oil, season with salt, pepper and Cajun seasoning, if using. Use a slotted spoon to transfer to a rimmed baking sheet and add tomatoes to the bowl; set aside. Roast at 425 for 20 minutes, remove and toss. Add tomatoes with juices and cook an additional 10 to 15 minutes, or until all veggies are tender. Toss with fresh herbs before serving. 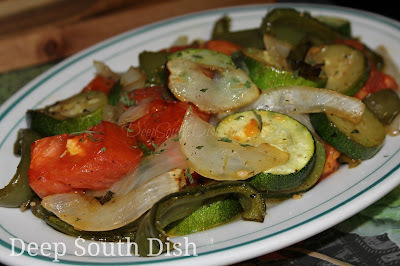 Cook's Notes: If you would rather your zucchini to be more on the firm side, wait to add it in the second part of the roast along with the tomatoes. If using dried herbs, add those in with the tomatoes. Add 2-3 toes of chopped garlic with the tomatoes if you like. When you add the tomatoes, sprinkle 1/4 to 1/2 cup of freshly grated Parmesan cheese over the top of veggies before returning to oven. I love vegetables and especially roasted. Yours looks delish. I have a recipe where I roast vegetables then place them in the blender with a small amount of cream cheese and pour it over fettuccine. It tastes wonderful and is low calorie. Placing the leftovers in a wrap is a tasty idea. Hadn't thought of that. Our weather here in central Virginia is cooling down too. The leaves are just beginning to turn. I can't wait until spring so I can plant a vegetable garden. Hopefully, the varmints are less here than where we lived before. Happy fall Mary! Happy Fall to you too Tricia! Roasted is my favorite way to eat veggies! This looks awesome! Perfect for ratatouille (sp?)! Great tips for roasting veggies too. Have a great weekend!